This is a great one, so don't miss out! Good Luck! Green Tones crafted wooden instruments and toys that engage children from ages 6 months to 4 years. From animal shakers, car, boat and train whistles, beginner drums, to glockenspiels, your little one will have a blast making music while developing cognitive abilities. eco-friendly from start to finish. If you'd like to read A Sensible Momma's full review, click here. Not only are Green Tones made with chemical-free wood, they also contain non-toxic glue, low VOC water based paint and recycled packaging! One lucky reader will win a Green Tones instrument of their own. 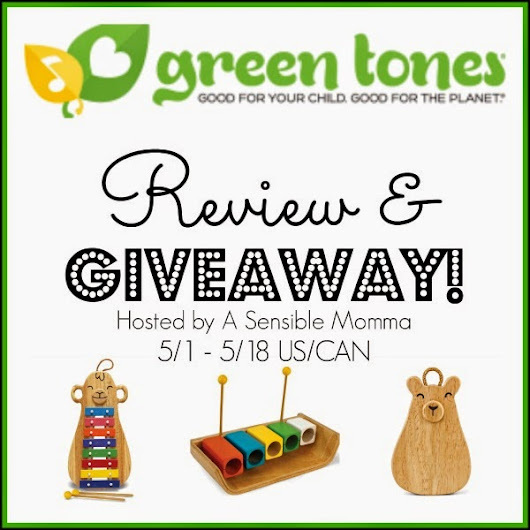 Enter the giveaway from 5/1 until 5/18 11:59pm EST. Enter on the easy rafflecopter below and good luck! I was not compensated for the promotion of this post. This giveaway is not associated with or endorsed by Facebook, Twitter, Pinterest or any other social media network. Sponsor is responsible for prize fulfillment, and product shipped will be chosen at random. All winning entries will be verified. Winner will be notified via e-mail and has 48 hours to respond before a new winner will be chosen. Direct any questions or comments to Anna at asensiblemomma [at] gmail [dot] com.